An Online Marketing Specialist is accountable for coordinating, executing and supporting marketing campaigns through diverse online marketing channels so as to drive leads generation. The specialists’ main focus is on planning, strategy, maintenance, optimization, and strategy of PPC advertisements and alignment with SEO for lead generation. 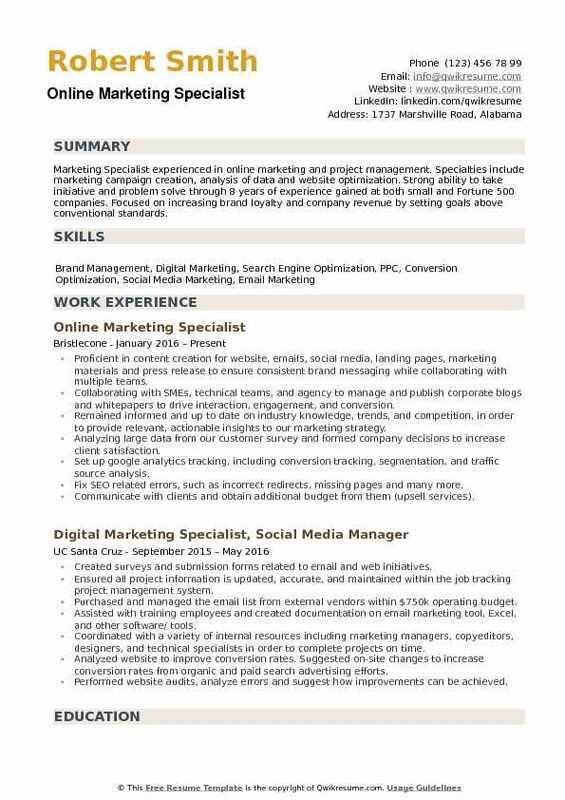 Duties commonly listed in the online marketing specialist resume include conducting marketing research, brainstorm about developing ideas for creative marketing campaigns, assist in inbound and outbound marketing tasks, liaising with external vendors, assisting in analyzing marketing data and execute initiatives to reach the wide target audience through email, social media or TV. 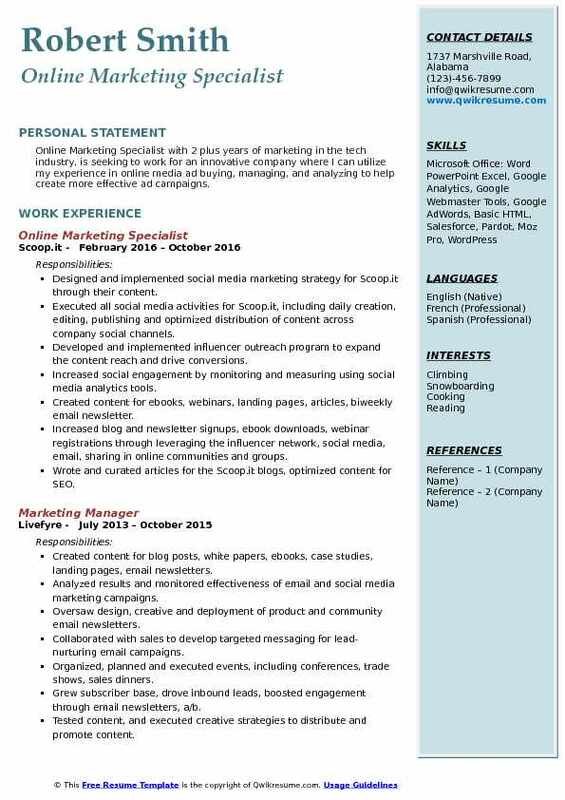 Resume Sample for this post should mention skills in various marketing elements such as SEO, Social media and market research methods, demonstrable experience in marketing data analytics tools, solid knowledge of marketing software such as Adobe creative suite and CRM. 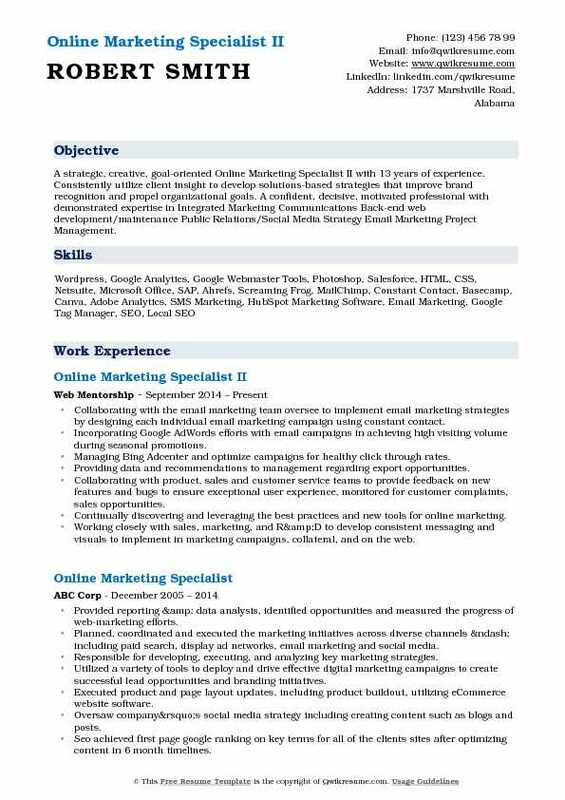 A Degree in marketing or communications or equivalent is ideal to state in Online Marketing Specialist Resume. Developing, implementing and managing the company’s Google AdWords campaigns by developing individual ad campaigns for different products and seasonal promotions, incorporating the image ad, text ad, google shopping campaign and placement ads in promoting different products. Picking, monitoring and modifying the keywords in achieving best results under the limited budget. Incorporating the Google conversion and Google analytics in collecting real-time data in enhancing ad performance. Developing the customized and targeted SEO landing page solutions to maximize the effectiveness of search campaigns and designing webpage layout to optimize conversion(Html5 and CSS). Optimizing the website exposure by analyzing search engine patterns to direct online placement of keywords or other content. Using the webpage optimization tools to track visitor behavior and enhancing the on-page experiences in achieving better conversion. Implementing online store customer service by taking customer phone calls and emails in getting real-time feedback on products and services. 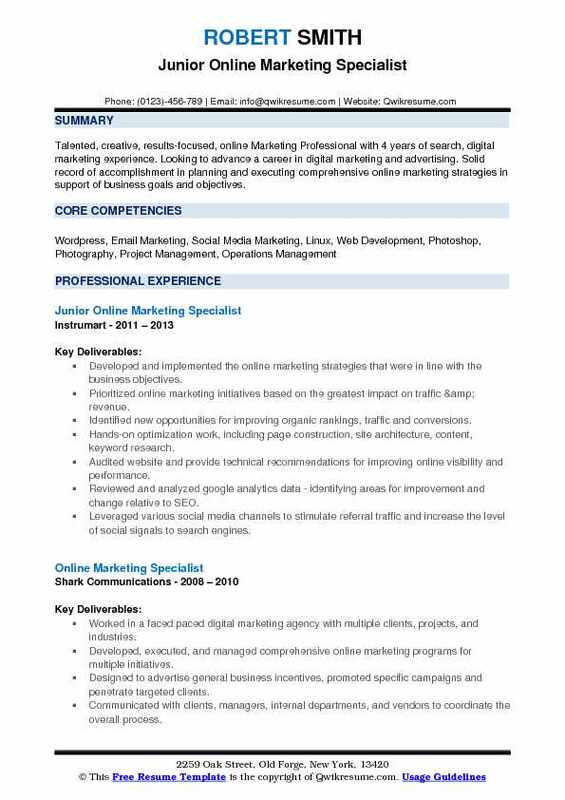 Objective : Talented, creative, results-focused, online Marketing Professional with 4 years of search, digital marketing experience. 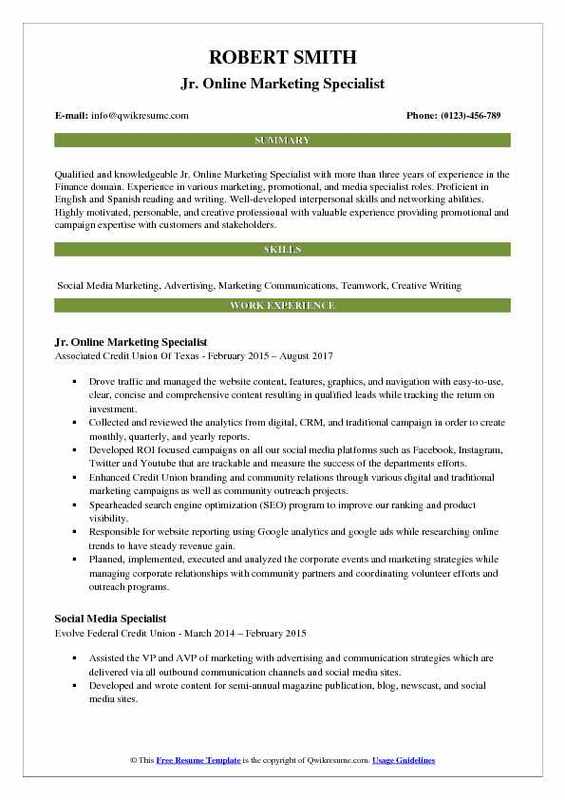 Looking to advance a career in digital marketing and advertising. Solid record of accomplishment in planning and executing comprehensive online marketing strategies in support of business goals and objectives. Developed and implemented the online marketing strategies that were in line with the business objectives. Prioritized online marketing initiatives based on the greatest impact on traffic & revenue. Identified new opportunities for improving organic rankings, traffic and conversions. Hands-on optimization work, including page construction, site architecture, content, keyword research. Audited website and provide technical recommendations for improving online visibility and performance. Reviewed and analyzed google analytics data - identifying areas for improvement and change relative to SEO. Leveraged various social media channels to stimulate referral traffic and increase the level of social signals to search engines. Developed and executed extremely targeted google "remarketing" strategies. (i.e., Remarketing to cart abandoners). Built back-link portfolios and coordinate link building campaigns based on domains needs. Objective : Qualified and knowledgeable Jr. Online Marketing Specialist with more than three years of experience in the Finance domain. Experience in various marketing, promotional, and media specialist roles. Proficient in English and Spanish reading and writing. Well-developed interpersonal skills and networking abilities. Highly motivated, personable, and creative professional with valuable experience providing promotional and campaign expertise with customers and stakeholders. Drove traffic and managed the website content, features, graphics, and navigation with easy-to-use, clear, concise and comprehensive content resulting in qualified leads while tracking the return on investment. Collected and reviewed the analytics from digital, CRM, and traditional campaign in order to create monthly, quarterly, and yearly reports. Developed ROI focused campaigns on all our social media platforms such as Facebook, Instagram, Twitter and Youtube that are trackable and measure the success of the department's efforts. Enhanced Credit Union branding and community relations through various digital and traditional marketing campaigns as well as community outreach projects. Spearheaded search engine optimization (SEO) program to improve our ranking and product visibility. Responsible for website reporting using Google analytics and google ads while researching online trends to have steady revenue gain. Planned, implemented, executed and analyzed the corporate events and marketing strategies while managing corporate relationships with community partners and coordinating volunteer efforts and outreach programs. 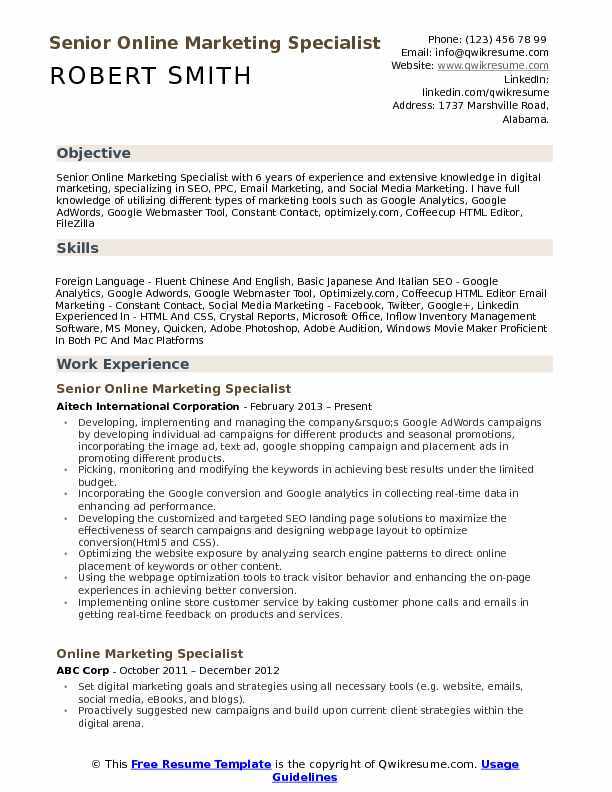 Summary : Online Marketing Specialist I with 11 years experience in online marketing. Focused in SEM and PPC but with knowledge also in SEO, web analytics, email marketing, and link building. Experienced in PR and event organizations. Managing and growing the worldwide SEM traffic on desktop, tablets, and mobile. Creating and managing English and in-language global campaigns in Google AdWords and Bing Ads. Managed to decrease CPA for the subscription campaigns by 65% (from $80 to $30) in 3 months. Managed to increase the free download of the product on desktop and mobile by 25% YoY. Working directly with the web designers to create new landing pages and A/B test web creatives to improve CRM. Creating and growing the traffic and installs coming from Facebook Ads and Twitter Cards. Creating and managing English and in-language campaigns to get installs at the decided CPA. Managed to scale up campaigns and results both on Facebook and Twitter channels. Managed to convert free users to paid ones with special offers and increased revenue by 10%. Managing all the paid marketing activities and deciding the strategy for each market. 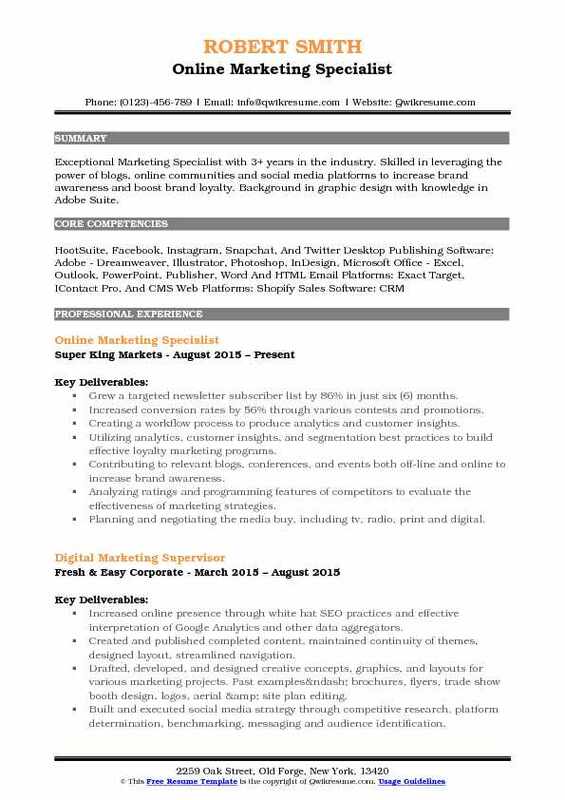 Objective : Online Marketing Specialist with 2 plus years of marketing in the tech industry, is seeking to work for an innovative company where I can utilize my experience in online media ad buying, managing, and analyzing to help create more effective ad campaigns. Designed and implemented social media marketing strategy for Scoop.it through their content. Executed all social media activities for Scoop.it, including daily creation, editing, publishing and optimized distribution of content across company social channels. Developed and implemented influencer outreach program to expand the content reach and drive conversions. Increased social engagement by monitoring and measuring using social media analytics tools. Created content for ebooks, webinars, landing pages, articles, biweekly email newsletter. Increased blog and newsletter signups, ebook downloads, webinar registrations through leveraging the influencer network, social media, email, sharing in online communities and groups. Wrote and curated articles for the Scoop.it blogs, optimized content for SEO. Increased site traffic through consistent participation in forums, discussion groups, commenting on blogs and within other active online communities. Manage the day-to-day functions of hubspot to maximize marketing efficiency - workflow automation, a/b. 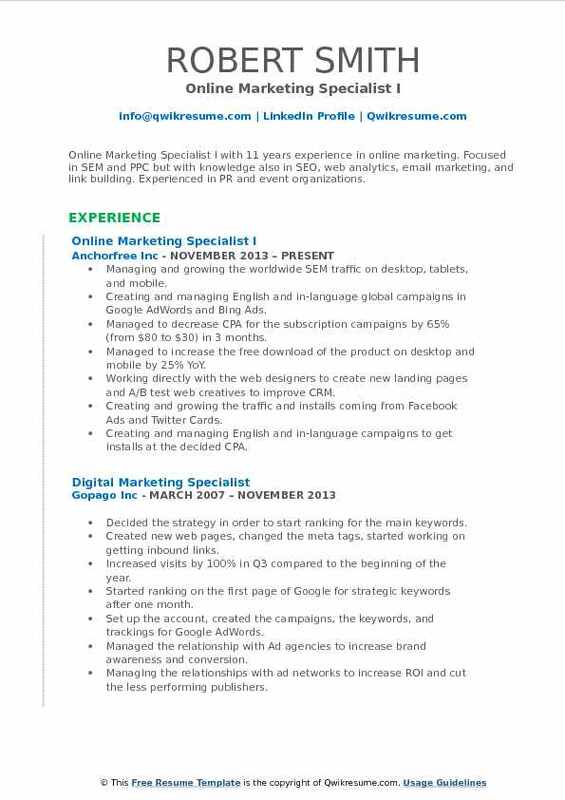 Summary : A strategic, creative, goal-oriented Online Marketing Specialist II with 13 years of experience. Consistently utilize client insight to develop solutions-based strategies that improve brand recognition and propel organizational goals. A confident, decisive, motivated professional with demonstrated expertise in Integrated Marketing Communications Back-end web development/maintenance Public Relations/Social Media Strategy Email Marketing Project Management. Collaborating with the email marketing team oversee to implement email marketing strategies by designing each individual email marketing campaign using constant contact. Incorporating Google AdWords efforts with email campaigns in achieving high visiting volume during seasonal promotions. Managing Bing Adcenter and optimize campaigns for healthy click through rates. Providing data and recommendations to management regarding export opportunities. Collaborating with product, sales and customer service teams to provide feedback on new features and bugs to ensure exceptional user experience, monitored for customer complaints, sales opportunities. Continually discovering and leveraging the best practices and new tools for online marketing. Working closely with sales, marketing, and R&D to develop consistent messaging and visuals to implement in marketing campaigns, collateral, and on the web. Landing page optimization: drove conversion increase of 10-25% for several websites by writing and testing landing page copy to improve conversions. Copywriting & content development: developed seo/viral-optimized content for client websites, overseeing the writing of many blog posts, site copy, and promotional messages. Summary : Online Marketing Specialist III over seventeen years of experience in leading small to medium teams with a focus on marketing and digital strategy. In addition to management experience, I also have extensive experience in web design and executing digital marketing campaigns. Developing and executing the marketing strategy for the company and its clients. One of my initial achievements was the transition of the majority of clients websites from older HTML templates to modern Dynamic CMS websites built on WordPress. Working with management to develop the company's new sales and marketing funnels. Developing comprehensive online marketing strategies and funnels including all applicable platforms and technologies, customizing to the clients' strengths and weaknesses, including web, mobile and app design, social media, video, email marketing and strategic partnerships. Designing and developing the email marketing campaigns across multiple platforms. Installing Google analytics and analyzing data to form actionable plans in the areas of traffic, goals, funnels, and conversions. Contributing towards the overall social media marketing strategy, including Facebook applications, daily content posting, calls to action campaigns, email opt-ins, video and other user engagement strategies. Developing marketing collateral in Adobe Photoshop, Illustrator, Premiere and After Effects. Successfully overhauled and efficiently managed SEM, using analytics to constantly improve performance. Gathering campaign results and working with senior management and other divisions to develop and deliver reporting for all campaigns and leads in order to illustrate effectiveness. 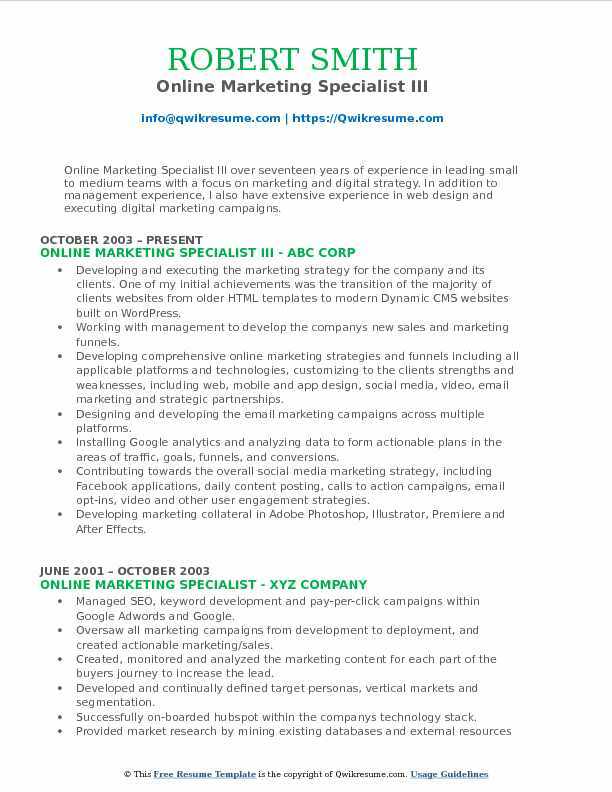 Objective : Exceptional Marketing Specialist with 3+ years in the industry. Skilled in leveraging the power of blogs, online communities and social media platforms to increase brand awareness and boost brand loyalty. Background in graphic design with knowledge in Adobe Suite. Grew a targeted newsletter subscriber list by 86% in just six (6) months. Increased conversion rates by 56% through various contests and promotions. Creating a workflow process to produce analytics and customer insights. Utilizing analytics, customer insights, and segmentation best practices to build effective loyalty marketing programs. Contributing to relevant blogs, conferences, and events both off-line and online to increase brand awareness. Analyzing ratings and programming features of competitors to evaluate the effectiveness of marketing strategies. Planning and negotiating the media buy, including tv, radio, print and digital. Managed the complete redesign and launch of the companys website in 4 months. Establishing the production schedules and communicating the project status to stakeholders. Prepare and distribute regular property marketing collateral/packages including narrative, maps, aerials, etc. Using both print and digital mediums, including the design and management of property. Strategize in conversion optimization, content marketing, branding, link-building, social media management & campaigns, and outreach. 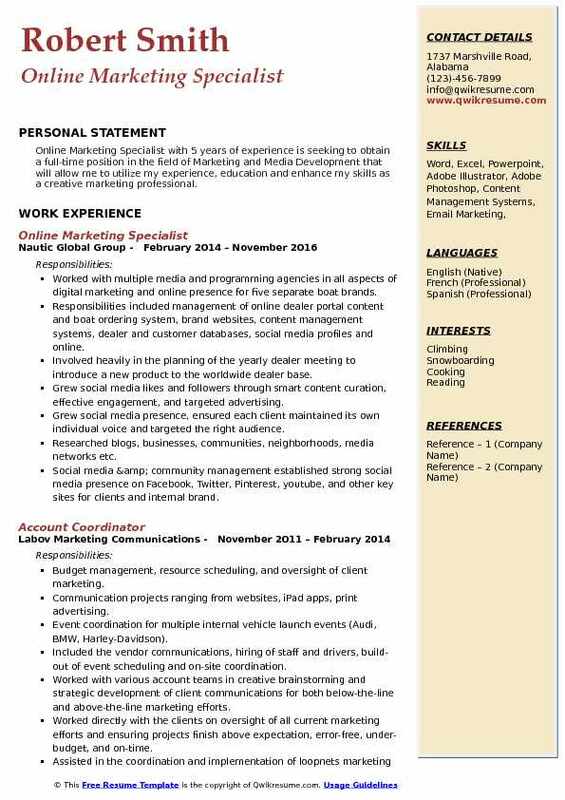 Headline : Online Marketing Specialist with 5 years of experience is seeking to obtain a full-time position in the field of Marketing and Media Development that will allow me to utilize my experience, education and enhance my skills as a creative marketing professional. Worked with multiple media and programming agencies in all aspects of digital marketing and online presence for five separate boat brands. Responsibilities included management of online dealer portal content and boat ordering system, brand websites, content management systems, dealer and customer databases, social media profiles and online. Involved heavily in the planning of the yearly dealer meeting to introduce a new product to the worldwide dealer base. Grew social media likes and followers through smart content curation, effective engagement, and targeted advertising. Grew social media presence, ensured each client maintained its own individual voice and targeted the right audience. Researched blogs, businesses, communities, neighborhoods, media networks etc. Social media & community management: established strong social media presence on Facebook, Twitter, Pinterest, youtube, and other key sites for clients and internal brand. Increased followers by 37% for Twitter, 30% for Facebook, 78% for LinkedIn, and 74% for Google+ through promoted/non-promoted targeted social media campaigns, resulted in increased e-commerce sales. Objective : Marketing Specialist experienced in online marketing and project management. Specialties include marketing campaign creation, analysis of data and website optimization. Strong ability to take initiative and problem solve through 8 years of experience gained at both small and Fortune 500 companies. Focused on increasing brand loyalty and company revenue by setting goals above conventional standards. Proficient in content creation for website, emails, social media, landing pages, marketing materials and press release to ensure consistent brand messaging while collaborating with multiple teams. Collaborating with SMEs, technical teams, and agency to manage and publish corporate blogs and whitepapers to drive interaction, engagement, and conversion. Remained informed and up to date on industry knowledge, trends, and competition, in order to provide relevant, actionable insights to our marketing strategy. Analyzing large data from our customer survey and formed company decisions to increase client satisfaction. Set up google analytics tracking, including conversion tracking, segmentation, and traffic source analysis. Fix SEO related errors, such as incorrect redirects, missing pages and many more. Communicate with clients and obtain additional budget from them (upsell services). Complete management of sem campaigns, from the creation of the account to daily management tasks.